Only one more day until Halloween and a hair-raising good time! Sorry, I couldn’t resist. Coming at you with another brew from Exhibit A Brewing Company. Description: Packed full of Galaxy, Mosaic, Azacca, and Cascade hops this double IPA seeks to raise your hairs (and perhaps even one or two hares as well). Mine was canned on 10/5/2017. Appearance: The body was super hazy and had an almost ghostly golden-yellow glow. A thin layer of white foam floated across the top. Smell: Pineapple juice upfront, followed by raw piney hop bitterness. Taste: Lots of juice upfront, with pineapple, tangerine, and mango leading the way. The fruits then blended into a warm, hoppy bitterness combining hops and pith. The finish was an excellent balance of juicy fruit and bitterness that peaked a few steps before becoming overly aggressive. Mouthfeel: On the higher end of medium with slightly less than moderate carbonation. Hype: No hype, but I did have some high hopes after liking my last beer from this brewery. Overall: Very big fan of this. 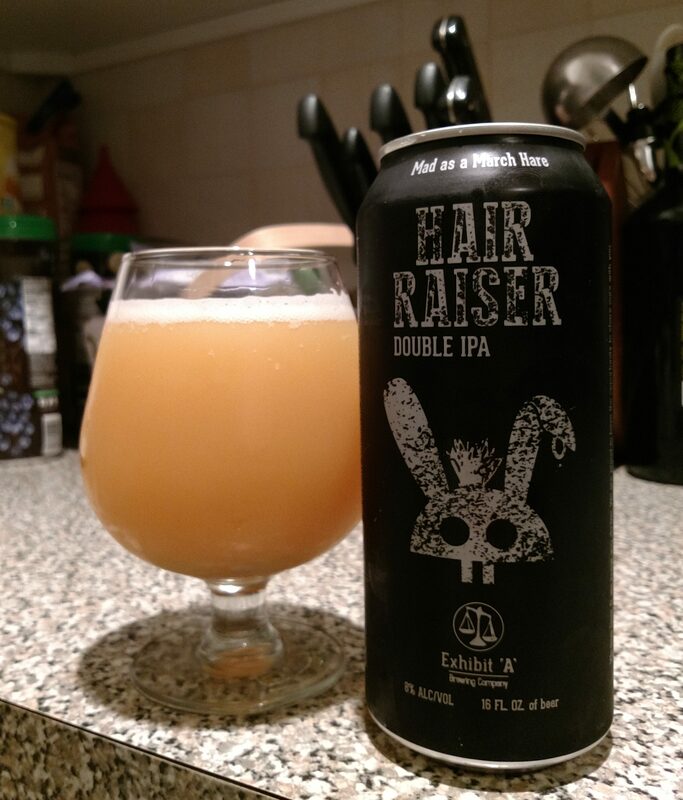 It reminded me a lot of Trillium’s Headroom coming out of the can with its glowing, thick hazy body and bitter juicy aromas. Taste wise it was a bit more balanced, though, having less intense levels bitterness and heat, which isn’t necessarily a bad thing. New England IPA fans need to check this one out.